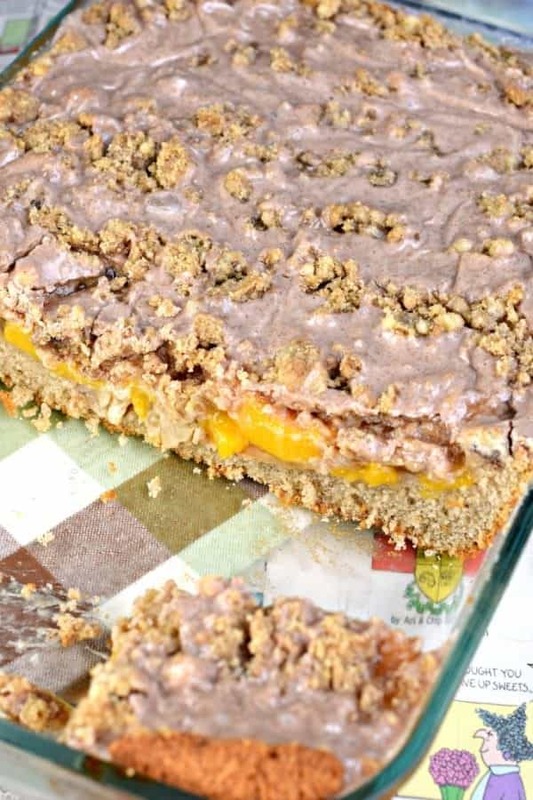 This delicious Peach Streusel Coffee Cake is a “must have” recipe for any time of year. 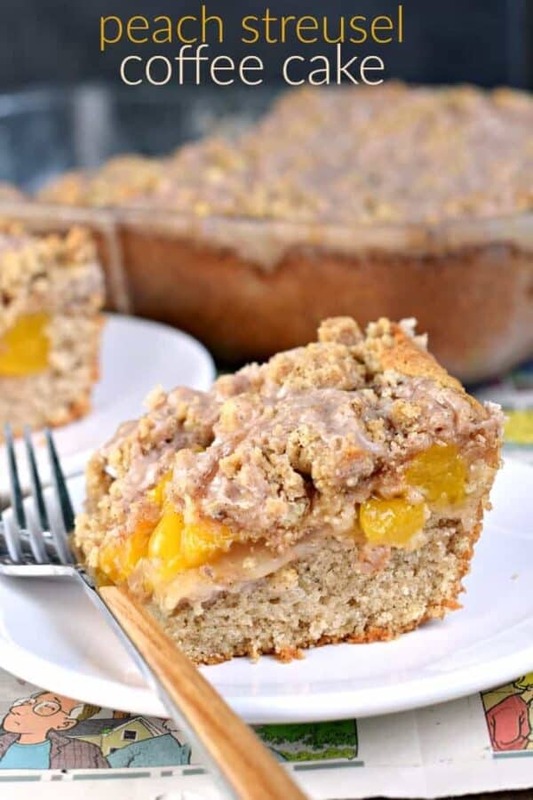 Perfect, moist spice cake topped with peach pie and cinnamon streusel! I am so thankful right now. Do you just have days where you feel overwhelmed with all the good in your life? Last week our son was home on leave (he’s in the Marines). And we had to say “see you later” to him as he left our home again. I mentioned last week that we celebrated 4 holidays in one day because we won’t be seeing him until next Spring. One of the things our group is doing is collecting items for care packages to send to our deployed troops this holiday season. This is very close to MY heart, as my own son will be deployed over the holidays. I not only pray for the safety of our military, but that they also find peace while away from their loved ones. 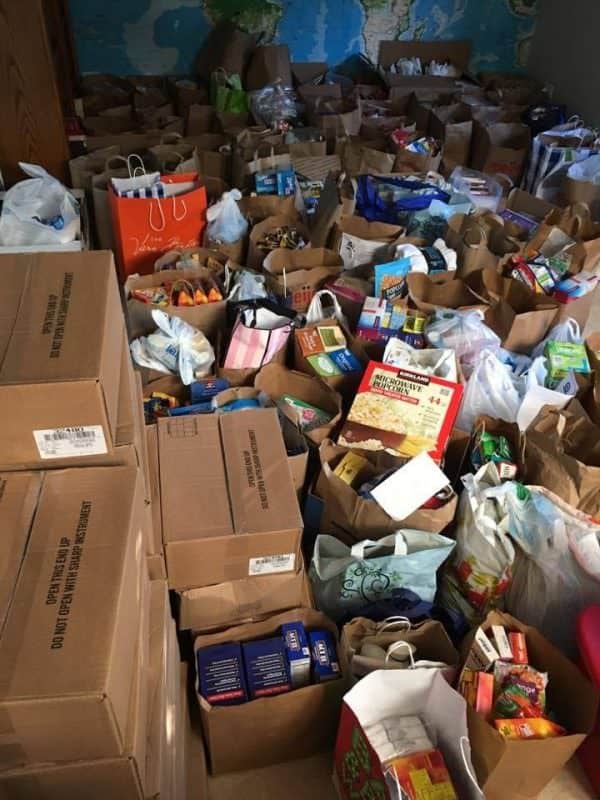 Our group had a goal of collecting enough items for about 50 packages. With only 15 members in our new group, this seemed like a great place to start. Guess what? We have collected supplies to fill at least 300 boxes. Yes, you read that right! There is a catch…and this is how YOU can help. Each box costs $16.75 to ship. While we are halfway to our goal financially, we still have a big need. If you want to help by sponsoring one or more boxes, or your business needs a way to give back this holiday season, PLEASE consider our group! You can support us financially by sending money to our PayPal (ChicagolandBlueStarMothers@gmail.com) or send me an email with another way to support (shugarysweets@yahoo.com). I’d love to hear from you! If you prefer to pay with cash/check, send me an email and I’ll get you the address for the Chicagoland Blue Star Mothers! If you have a member of the military who is deployed overseas this holiday, you can also email us at ChicagolandBlueStarMothers@gmail.com and request that a box get sent to your loved one! We are a 501(c)3 organization and would be happy to send you a letter for tax purposes (be sure to include a mailing address with your paypal note)! Thank you Thank you Thank you! If you can’t help financially this year, I get it. Would you pray for our young men and women? Keep them in your thoughts and don’t ever take your freedom for granted! 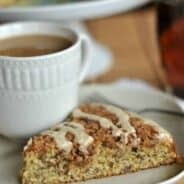 And while you’re having those silent reflections, may a suggest a slice of this Peach Streusel Coffee Cake? With a hot cup or coffee or tea, it’s a great way to enjoy your morning! 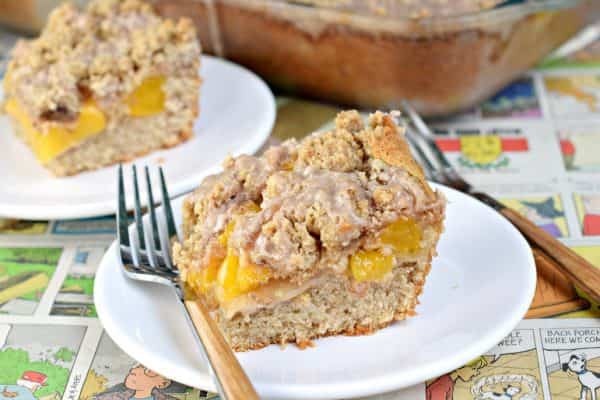 This delicious Peach Streusel Coffee Cake is a "must have" recipe for any time of year. Perfect, moist spice cake topped with peach pie and cinnamon streusel! Grease and flour (or use baking spray) a 13x9 baking dish and set aside. In a mixing bowl, beat flour, sugar, baking powder, baking soda, cinnamon, and salt on low until blended. Beat in softened butter until crumbly. Add in eggs, vanilla and milk and beat for several minutes until fluffy and fully combined. Pour batter into prepared baking dish. Top batter with peach pie filling. Combine sugar with cinnamon and salt. 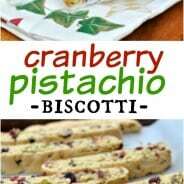 Mix in melted butter, flour and nutmeg with a large fork until crumbly. Sprinkle evenly over peach layer. Bake cake in a preheated 325 degree F oven for 55-60 minutes. Whisk the sugar, cinnamon, and milk together until smooth. When cake is removed from oven, pour glaze over warm cake. Allow cake to cool before serving. Store cake covered in refrigerator for up to 5 days. ENJOY. I am tearing up with joy for you too reading this post! I love all that you are doing to help out our military–including taking care of your sweet boy and loving on him when he is home. PS. This cake is fabulous! I absolutely love that you and your group are doing this for deployed soldiers! What an amazing thing to have gotten that many donations so far. And this cake…I wish I had a slice with my coffee right now! It’s truly a humbling experience to see how many people have helped!! Wow, this is awesome!! I will definitely be donating. And this cake?! I’m seriously in love. Which I could enjoy some with my coffee in the morning! Awww your sweet note with your donation brought me to tears! THANK YOU for not only the kind words about me and my blog, but also for supporting our military 🙂 I’m so glad to have connected! I live in Ontario, Canada and follow your blog regularly. 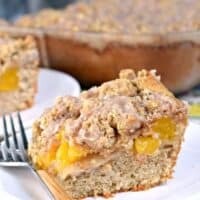 The recipe for the Peach Streusel Coffee Cake looks amazing, and I have a question. I have never seen canned peach pie filling in our stores here, so wondered if using just peaches would work?? P.S. 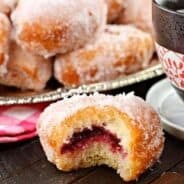 Thanks for your wonderful blog, I’ve tried several of your recipes!